Space shuttle Atlantis is transported to the cavernous Vehicle Assembly Building where the ship will be mated to the external fuel tank and twin solid rocket boosters for a late-August liftoff. A camera was mounted in the front of space shuttle Discovery's flight deck looking back at the astronauts during launch. This video shows the final minutes of the countdown and the ride to space with the live launch audio included. The movie shows what it would be like to launch on the shuttle with the STS-121 crew. A high-altitude WB-57 aircraft flying north of Discovery's launch trajectory captures this incredible aerial footage of the space shuttle's ascent from liftoff through solid rocket booster separation. This is the full launch experience! The movie begins with the final readiness polls of the launch team. Countdown clocks then resume ticking from the T-minus 9 minute mark, smoothly proceeding to ignition at 2:38 p.m. Discovery rockets into orbit, as seen by ground tracker and a video camera mounted on the external tank. About 9 minutes after liftoff, the engines shut down and the tank is jettisoned as the shuttle arrives in space. MiTEx -- an experimental U.S. military project to test whether the advanced technologies embedded in two miniature satellites and a new upper stage kick motor can operate through the rigors of spaceflight -- is launched from Cape Canaveral aboard a Boeing Delta 2 rocket. The planet-wide dust storms that periodically cloak Mars in a mantle of red may be generating a snow of corrosive chemicals, including hydrogen peroxide, that would be toxic to life, according to two new studies published in the most recent issue of the journal Astrobiology. Based on field studies on Earth, laboratory experiments and theoretical modeling, the researchers argue that oxidizing chemicals could be produced by the static electricity generated in the swirling dust clouds that often obscure the surface for months, said University of California, Berkeley, physicist Gregory T. Delory, first author of one of the papers. If these chemicals have been produced regularly over the last 3 billion years, when Mars has presumably been dry and dusty, the accumulated peroxide in the surface soil could have built to levels that would kill "life as we know it," he said. "If true, this very much affects the interpretation of soil measurements made by the Viking landers in the 1970s," said Delory, a senior fellow at UC Berkeley's Space Sciences Laboratory. A major goal of the Viking mission, comprised of two spacecraft launched by NASA in 1975, was testing Mars' red soil for signs of life. In 1976, the two landers aboard the spacecraft settled on the Martian surface and conducted four separate tests, including some that involved adding nutrients and water to the dirt and sniffing for gas production, which could be a telltale sign of living microorganisms. The tests were inconclusive because gases were produced only briefly, and other instruments found no traces of organic materials that would be expected if life were present. These results are more indicative of a chemical reaction than the presence of life, Delory said. "The jury is still out on whether there is life on Mars, but it's clear that Mars has very chemically reactive conditions in the soil," he said. "It is possible there could be long-term corrosive effects that would impact crews and equipment due to oxidants in the Martian soil and dust." All in all, he said, "the intense ultraviolet exposure, the low temperatures, the lack of water and the oxidants in the soil would make it difficult for any microbe to survive on Mars." The article by Delory and his colleagues appearing in the June issue of Astrobiology demonstrates that the electrical fields generated in storms and smaller tornadoes, called dust devils, could split carbon dioxide and water molecules apart, allowing them to recombine as hydrogen peroxide or more complicated superoxides. All of these oxidants react readily with and destroy other molecules, including organic molecules that are associated with life. A second paper, coauthored by Delory, demonstrates that these oxidants could form and reach such concentrations near the ground during a storm that they would condense into falling snow, contaminating the top layers of soil. According to lead author Sushil K. Atreya of the Department of Atmospheric, Oceanic, and Space Sciences at the University of Michigan, the superoxidants not only could destroy organic material on Mars, but accelerate the loss of methane from the atmosphere. Coauthors of the two papers are from NASA Goddard Space Flight Center; the University of Michigan; Duke University; the University of Alaska, Fairbanks; the SETI Institute; Southwest Research Institute; the University of Washington, Seattle; and the University of Bristol in England. Delory and his colleagues have been studying dust devils in the American Southwest to understand how electricity is produced in such storms and how the electric fields would affect molecules in the air - in particular, molecules like those in the thin Martian atmosphere. "We are trying to look at the features that make a planet habitable or uninhabitable, whether for life that developed there or for life we bring there," he said. Based on these studies, he and his colleagues used plasma physics models to understand how dust particles rubbing against one other during a storm become positively and negatively charged, much the way static electricity builds up when we walk across a carpet, or electricity builds in thunderclouds. 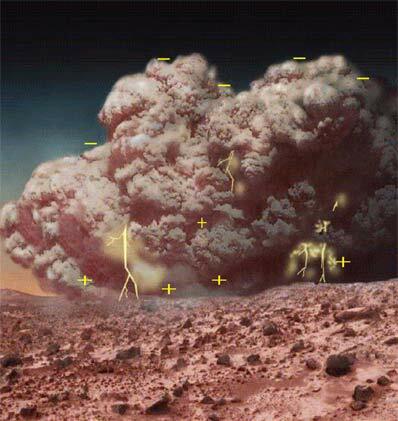 Though there's no evidence for lightning discharges on Mars, the electric field generated when charged particles separate in a dust storm could accelerate electrons to speeds sufficient to knock molecules apart, Delory and his colleagues found. "From our field work, we know that strong electric fields are generated by dust storms on Earth. Also, laboratory experiments and theoretical studies indicate that conditions in the Martian atmosphere should produce strong electric fields during dust storms there as well," said co-author Dr. William Farrell of NASA's Goddard Space Flight Center in Greenbelt, Md. Since water vapor and carbon dioxide are the most prevalent molecules in the Martian atmosphere, the most likely ions to form are hydrogen, hydroxyl (OH) and carbon monoxide (CO). One product of their recombination, according to the second study, would be hydrogen peroxide (H2O2). At high enough concentrations, the peroxide would condense into a solid and fall out of the air. If this scenario has played out on Mars for much of its history, the accumulated peroxide in the soil could have fooled the Viking experiments looking for life. While the Labeled Release and the Gas Exchange experiments on the landers detected gas when water and nutrients were added to Martian soil, the landers' Mass Spectrometer experiment found no organic matter. At the time, researchers suggested that very reactive compounds in the soil, perhaps hydrogen peroxide or ozone, could have produced the measurements, imitating the response of living organisms. Others suggested a possible source for these oxidants: chemical reactions in the atmosphere catalyzed by ultraviolet light from the sun, which is more intense because of Mars' thin atmosphere. The predicted levels were far lower than needed to produce the Viking results, however. Production of oxidants by dust storms and dust devils, which seem to be common on Mars, would be sufficient to cause the Viking observations, Delory said. Thirty years ago, some researchers considered the possibility that dust storms might be electrically active, like Earth's thunderstorms, and that these storms might be a source of the new reactive chemistry. But this had been untestable until now. "The presence of peroxide may explain the quandary we have had with Mars, but there is still a lot we don't understand about the chemistry of the atmosphere and soils of the planet," he said. The theory could be tested further by an electric field sensor working in tandem with an atmospheric chemistry system on a future Mars rover or lander, according to the team members. The team includes Delory, Atreya, Farrell, and Nilton Renno & Ah-San Wong of the University of Michigan; Steven Cummer of Duke University, Durham, N.C.; Davis Sentman of the University of Alaska; John Marshall of the SETI Institute in Mountain View, Calif.; Scot Rafkin of the Southwest Research Institute in San Antonio, Texas; and David Catling of the University of Washington. The research was funded by NASA's Mars Fundamental Research Program and by NASA Goddard internal institutional funds.